Although Alabama as a state has set a high reputation for itself in the travel industry, little is heard about Dauphin Island. Located three miles south of Mobile Bay, Dauphin Island is Barrier Island with the crystal-blue waters of the Gulf of Mexico. Roughly 1,200 people take refuge in this quaint paradise, allowing for an uninterrupted life. Away with traffic, overflowing theme parks, and outlet malls. In fact, there are no traffic lights on Dauphin Island—instead, choose to travel down walking trails, bike paths, and the warm, sandy beaches. This destination is particularly ideal for families who need to hit pause on the city. Let the magnificent coasts views, the Southern charm, and the natural flow of life overtake you. 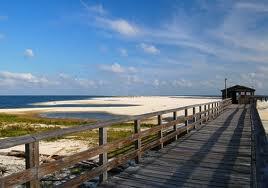 You might be surprised to learn that Dauphin Island as not always so friendly and playful. Indeed, Dauphin Island was organically called “Massacre Island” by the French explorer, Pierre Le Moyne, sieur d’lberville in 1699. He was inspired by the overwhelming amount of human skeletons. However, it was later discovered that the island was simply a burial mound that had become uncovered by a hurricane. Decades later, Dauphin Island promptly renamed by Louis XIV of France’s great-grandson. Although often mistaken as “Dolphin Island”, dauphin is the French variation of “dolphin.” And so, the lovely island continued to endure centuries of hardship. Now, Fort Gains sits on the eastern tip of Dauphin Island as one America’s most endangered historical sights. This monument used to protect the entrance of Mobile Bay over 150 years ago when the Confederate forces took over later, in 1861. Thankfully, Dauphin Island was able to transition to a peaceful way of life. The island hosts multiple bird sanctuaries and a myriad of water-related activities. Of course, you cannot forget about the outstanding clear waters that surround the soft white sand. Try your hand at charter fishing or taste-test the delicious meals at Bayley’s Seafood. Moreover, visitors often come to Dauphin Island for Shell Mound Park—a tropical nature heaven with giant oaks and incredible wildlife. The Dauphin Sea Lab and the Action Outdoors boat trips are also a great activity. Stop in first for nourishment at the Lighthouse Bakery for one of their famous Caramel Almond Buns or Sausage Waffles as well.